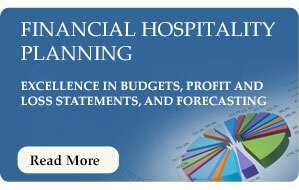 We are Utah’s number one ranked Food and Beverage Consulting firm. 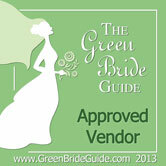 We pride ourselves on understanding that it is you, the guest, who knows what is best for your business. We are here to help you achieve that next step or put in place something specific that your team needs. We are here to assist you all the help your Brand needs in order to achieve your goals. No matter what “Division or Divisions” you are inquiring about, we have absolute confidence that you will be happy 100% with our “Services”. Whether we are serving an amazing Five Diamond property, or the best chain restaurant in town, there is no job that we consider too big or too small. Each “Program” is tailored to fit each and every property. We may work besides you as a coach, work with your team one on one, and/or take care of your drafting needs for a superior kitchen design. However, setting up Food and Beverage “Systems” are by far the most popular. Some examples of these “Systems” include work with both Front of the House and Back of the House operations, plus waste records, temperature logs, proper cooling of foods, cleaning schedules, and daily, weekly, and monthly inventories. The list is just a glimpse of what The Laughing Pear Food and Beverage Consulting Group may mean to you and your investment. The possibilities are endless. We get many people asking that question. Here at The Laughing Pear Food and Beverage Consulting Group we want the best for you, but we understand the state of the economy, and try to assist on every level possible. For a number of owner/operators their business may be their nest egg and we want them to be happy and successful! Everyone deserves someone in side of the ring. We realize that your business/private resident is extremely important to you - that is why our team members have only the highest of respect for all our guests. Moreover, there is not one team member you would be working with who has not been in food and beverage operations for a minimum of ten years. Lastly and most importantly, we want you to know that we believe in excellent service from start to finish. The Laughing Pear Food and Beverage Consulting Group continues to be affordable, as we understand the financial dynamics that make up a Food and Beverage operation. Our team focuses on you and you alone and this is how we can deliver, with accuracy, excellence in food and beverage consulting. We are a cutting edge food and beverage consulting company that is team driven and consistently learning new ways to “Service” your teams better! We look forward to speaking in the very near future. 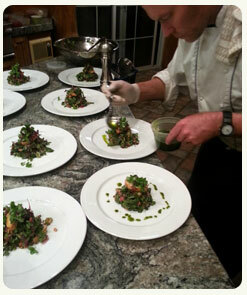 Give Chef/Owner David E. Kratky a call now at 435.671.2351 to set up your complimentary consultation. Ah, the holiday season! Where most conversations and thoughts are about food and when friends and family gather to celebrate and give thanks. We have our fair share of talented Chefs here in Park City and Deer Valley and all of us at Luxury Rentals in Park City feel very fortunate to be working with our very talented Chef Dave Kratky of The Laughing Pear. Chef Dave is passionate about food and expressing his creations with unique food and wine pairings. 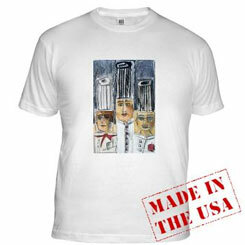 Chef Dave began his love for cooking at the age of 14 at an Italian restaurant in South Florida. 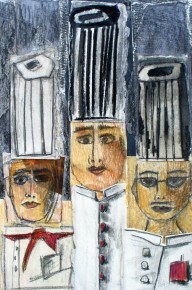 He continued on to receive his Associates Degree in Culinary Arts from the prestigious Florida Culinary Institute. With several other courses from The Culinary Institute of America, Chef Dave says, “It is vital to continue learning and this is why I love what I do, you can ever learn enough.” He goes on to say, “Constant challenges are what I love and making the guest happy are really what it is all about!” Chef Dave has studied under such renowned Chefs as; Chef Pedro Seville from Spain; Chef Angelo Debucco from Italy and Chef Jean Louie Montecoat from France. 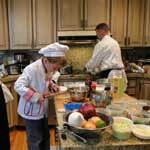 Both culinary school training and training under such great chefs is what he believes has made him who he is today in his profession. When you book your stay with us at Luxury Rentals in Park City, treat yourself to an amazing evening of culinary delights with our very own Chef Dave! 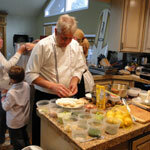 For all of the mouthwatering details about Chef Dave, check out his website at The Laughing Pear. 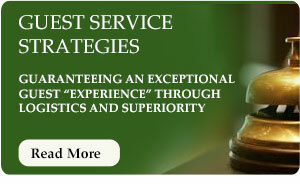 EXCEPTIONAL VISION, QUALITY, AND CLIENT CARE! 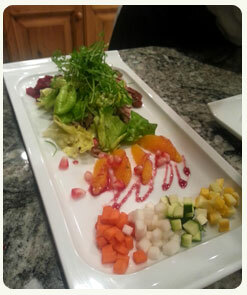 - We cannot begin to say enough wonderful things about The Laughing Pear! We are here in Park City, Utah for the Sundance Film Festival. I am here representing my Film Production Company. So its crucial that we take great care of our clients. This is why we went with Chef David Kratky (Chef/Owner of the Laughing Pear) I have used Chef Dave in the past and of course, I wanted to have him again. Our event started on Friday and will go until the following Sunday when the Film Festival ends. 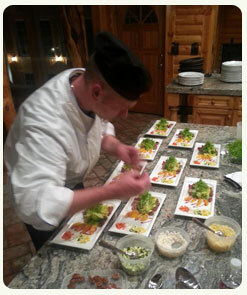 Chef Dave has put together a marvelous catering venue for our guests. From the moment we began working with Chef Dave, we could tell that he was going to make our event spectacular and worry free. He did just that! We had very specific needs for our guests and Chef Dave handled it with great attention and ease. The first responsibility of any great experience is to keep you in the bubble, the soft-serve cocoon of illusion where you forget the world exists for anything but your pleasure. 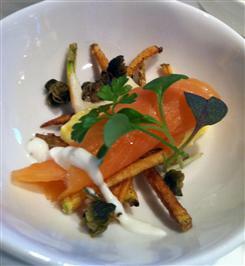 As Chef Dave and his superior team accomplished every detail with such grace. We we're so impressed with our 10 course meal. We felt as though we were in another atmosphere. 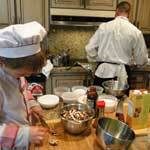 I have always had challenges with past Food and Beverage Catering/Private Events Functions. Chef Dave changed all that and from know on when ever we come and stay in our Home in Park City, Chef Dave is our CHEF!!! I am not one to recommend anyone. 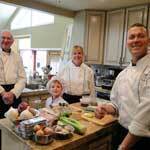 But I MUST say that I highly Recommend CHEF DAVE and The Laughing Pear Group!!!! Thanks again for the great week of meals. You definitely impressed everyone. I will refer you to anyone I know who needs a chef for any activity! If you are looking for consulting, design, food and beverage consulting in Park City, commercial kitchen design, home kitchen design, a design team in Park City, Salt Lake City, Provo, Heber or the nearby these cities please give us a call today. We are happy to help (435) 671-2351 and in most cases offer free consultation!